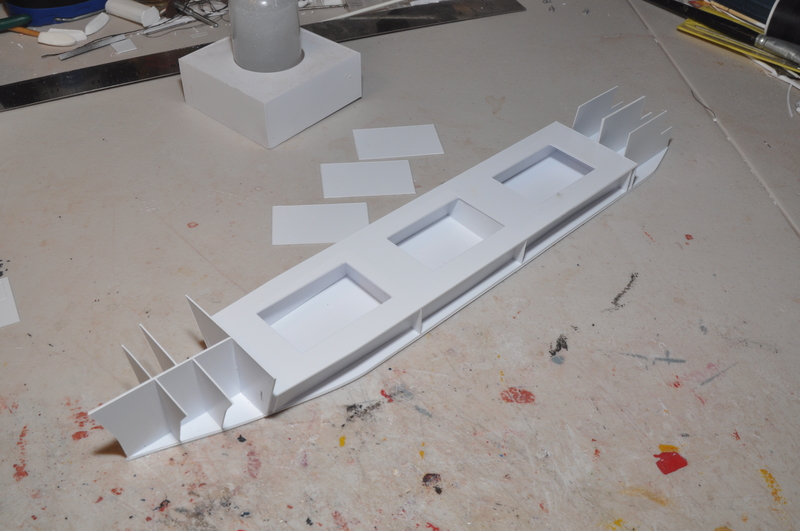 Laminate the bottoms and the forward keel. 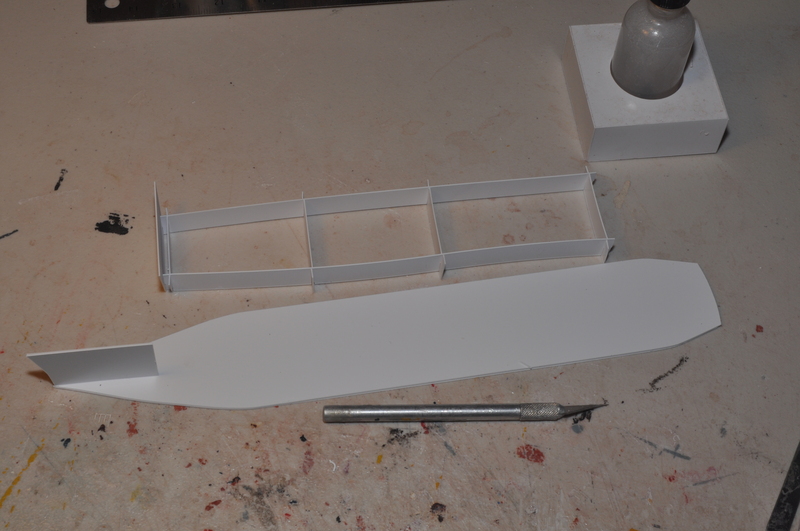 Glue the forward keel, aligning at the tip of the bow, and making sure it is centered. 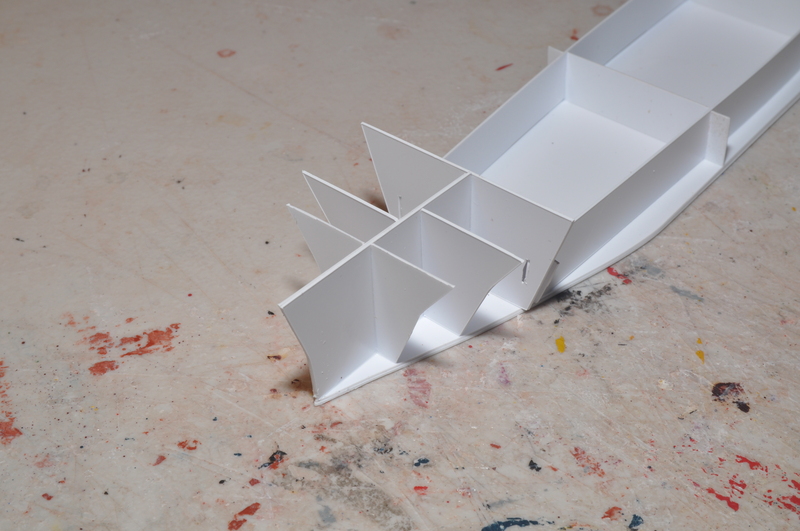 Assemble the sections and two inner keels. The tall tapered section is at the very front; the short tapered section is next. 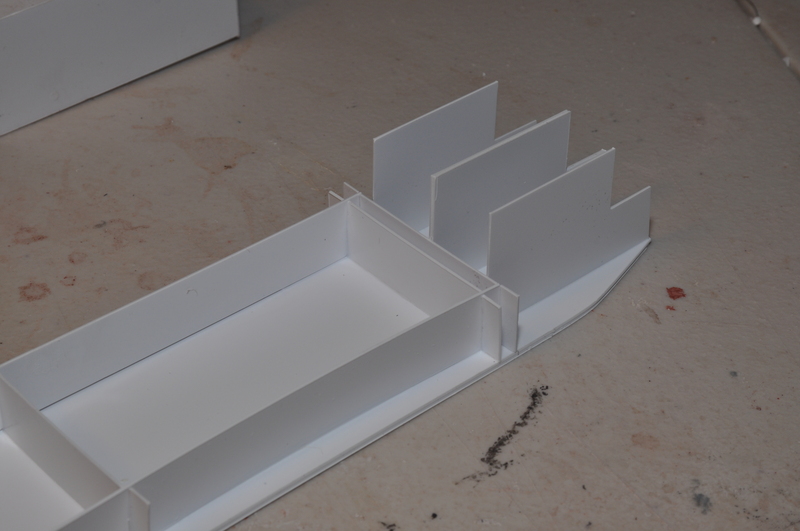 Glue up the keels and sections as shown. At the stern, laminate the two longer rear keels together and glue in the center. 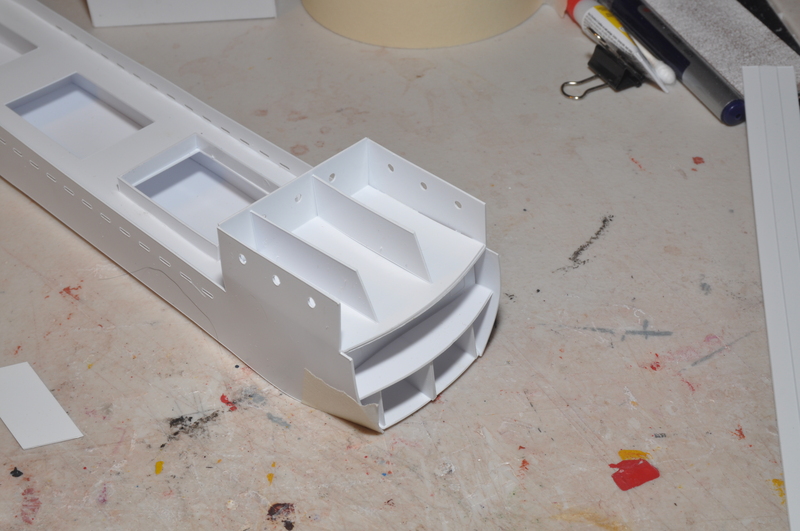 The shorter keel sections are glued on either side. Glue up to bow sections. They may not meet exactly if the keel is off center a bit. This does not matter as long as they match the width at the bottom. 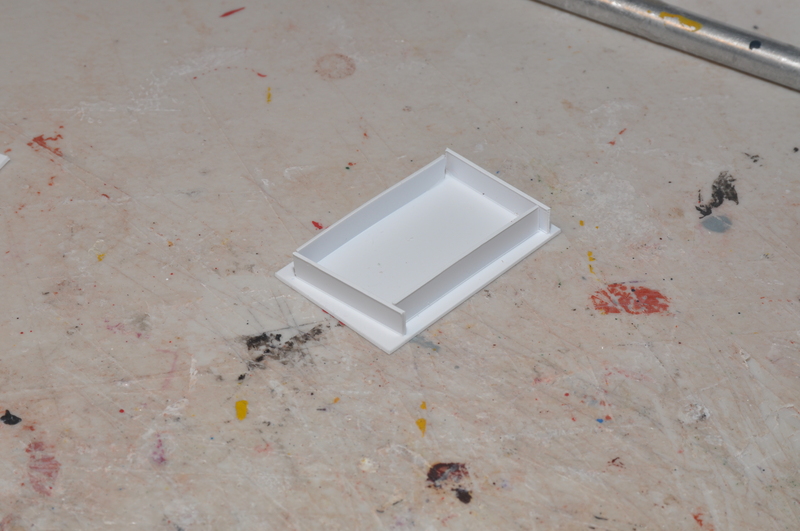 Glue the deck on as shown. 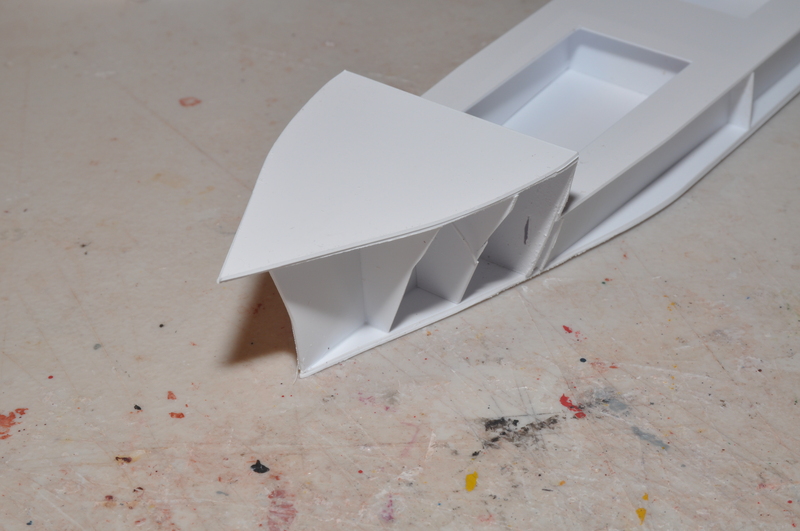 The tapered end is towards the bow. 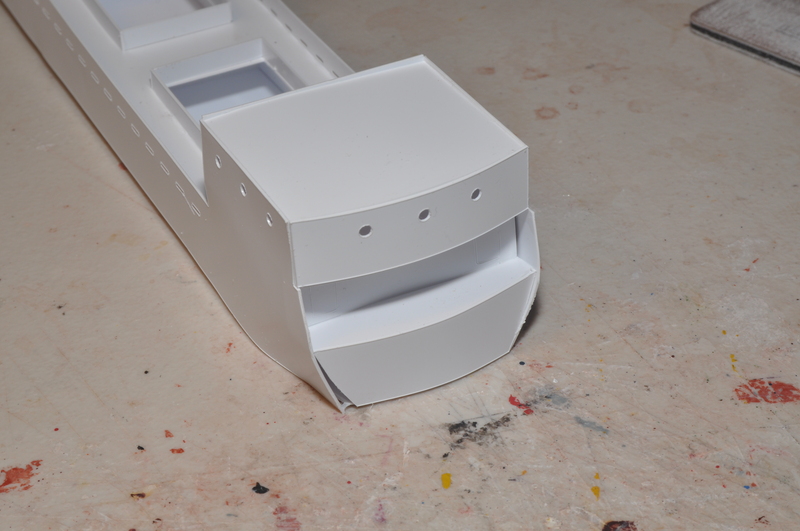 Glue on the tall rear bulkhead. 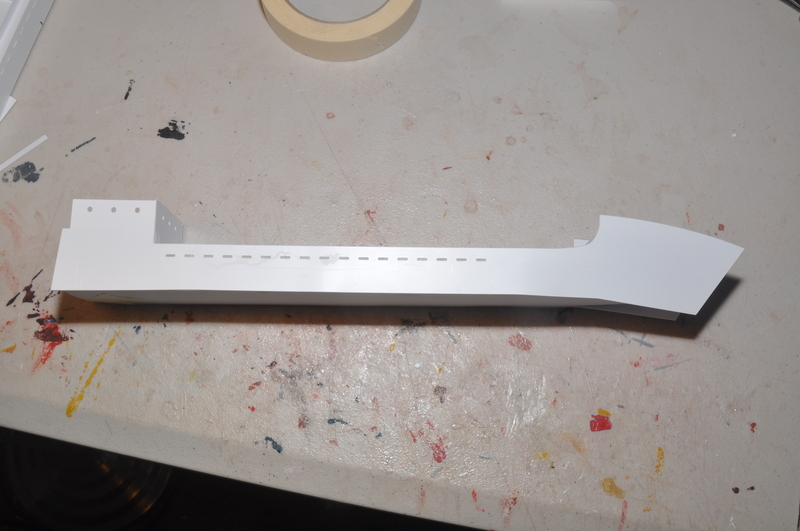 Glue on the forward bulkhead, laminating it to the section. Laminate and glue on the forecastle deck. 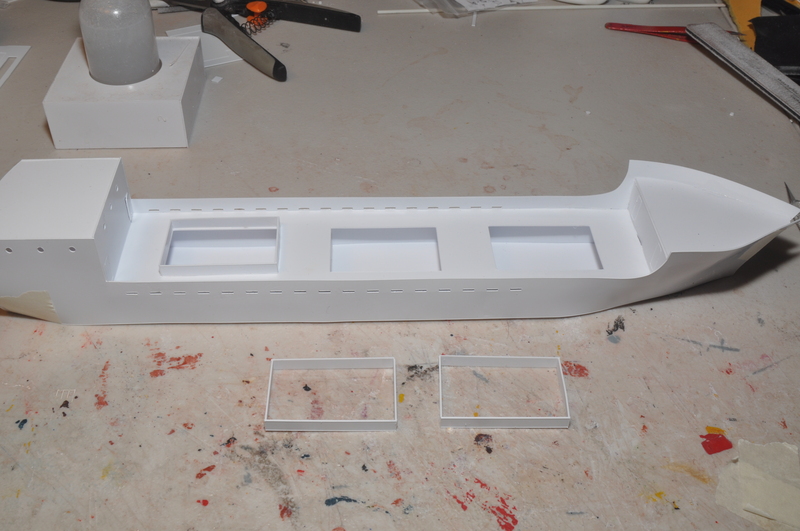 Making sure you have the longest bulkhead, glue it to the stern as shown. Glue the lower (deeper) deck to the keels. 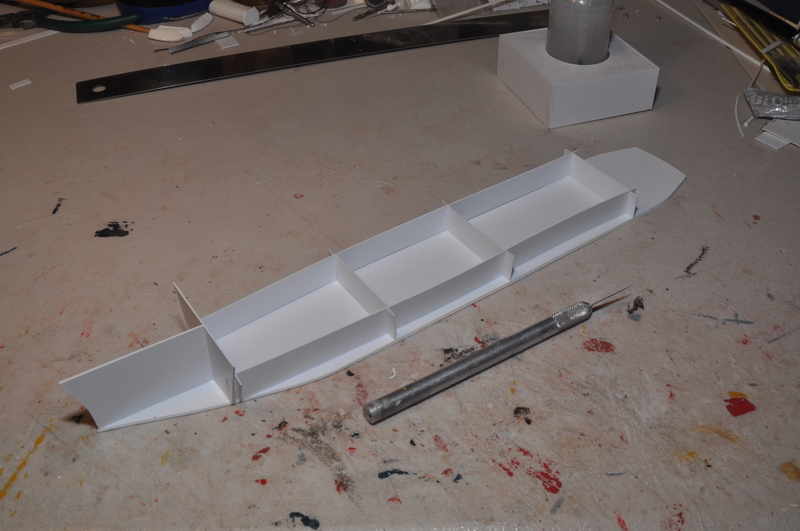 Laminate and glue the first poop deck to the keels, then glue the shallower deck underneath to reinforce the joints. 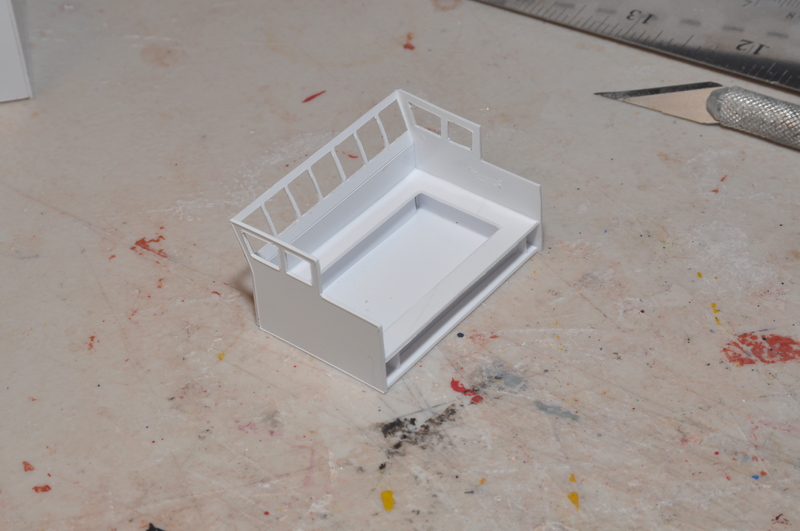 I used only a single poop deck during this build, and added a second for sturdiness. Line the skins up as shown. The skin just clips the tall rear bulkhead. Make sure the skins stay even with the bottom. 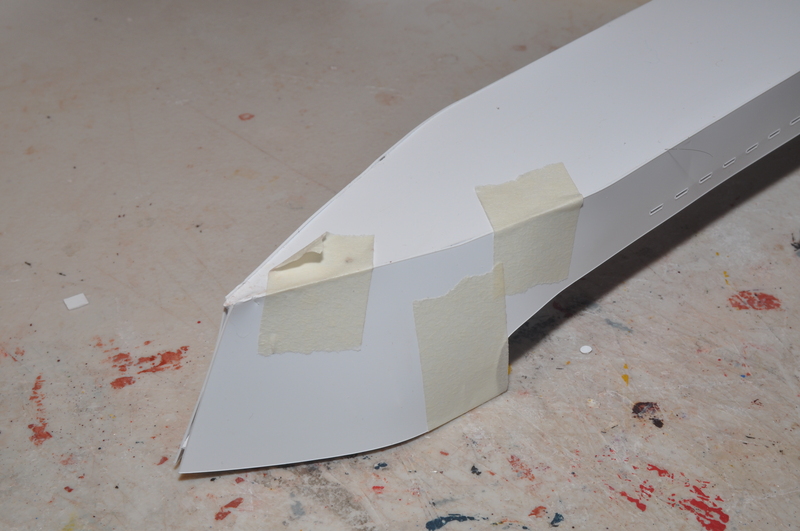 Use masking tape to clamp the skins to the bottom and deck, and across the bow. 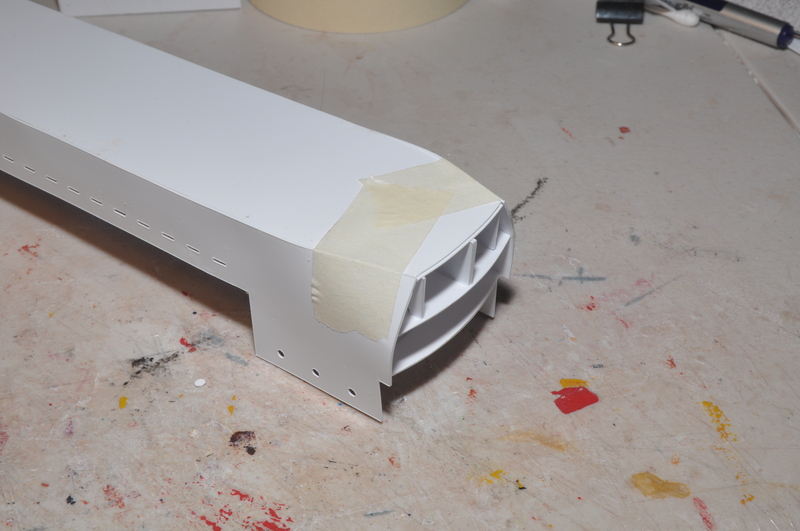 More masking tape at the stern. 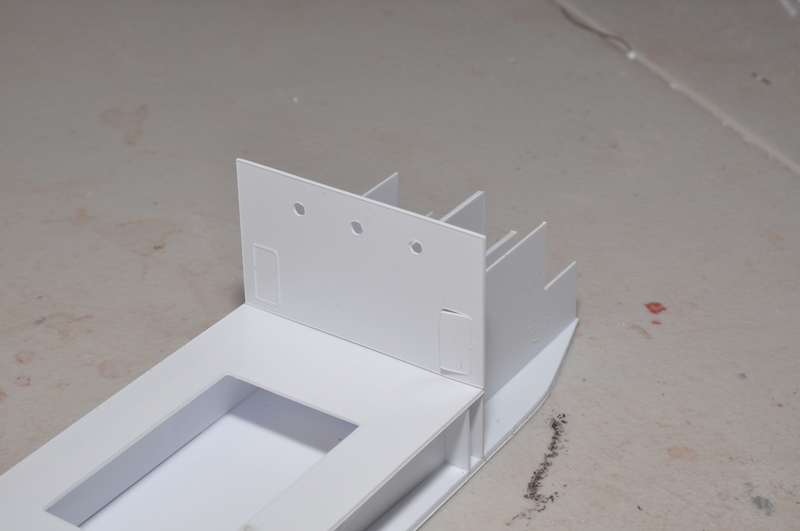 Cut a few stiffeners from the blank provided and glue on the roof (not shown). Assemble the hatch coamings. 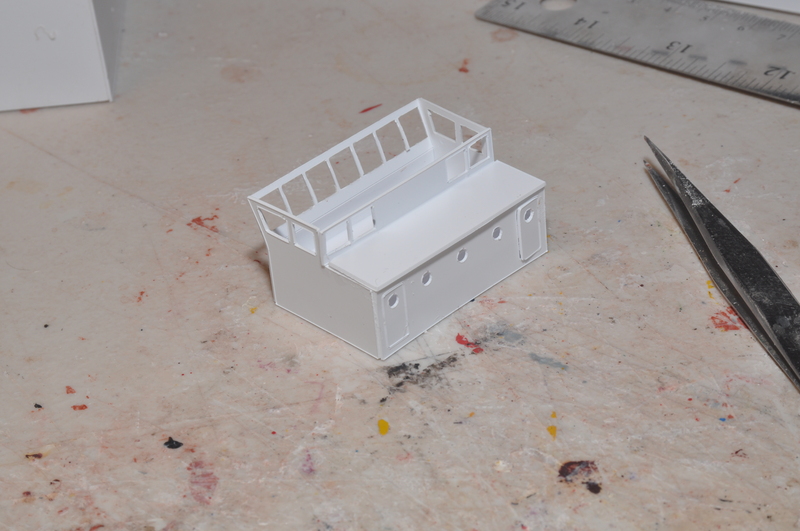 Production models have an outer ribbed skin for two thickness of material and a more 3D effect. 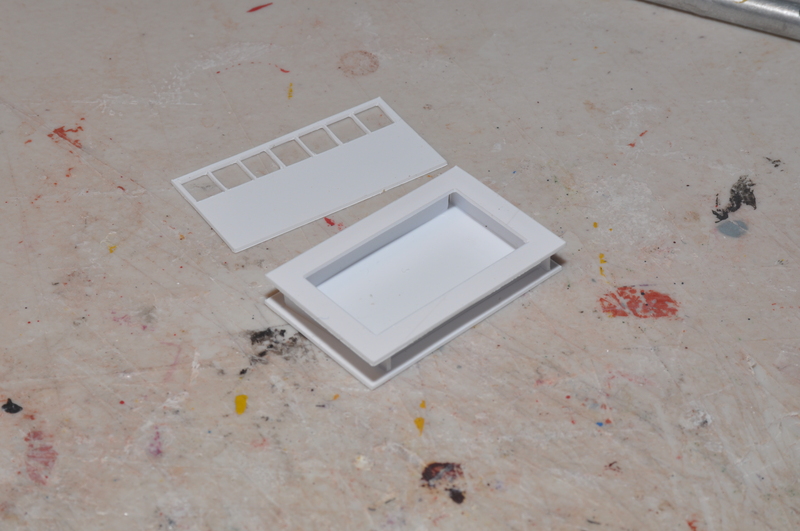 Attach the transom. Some trimming may be necessary for a clean, flush fit. 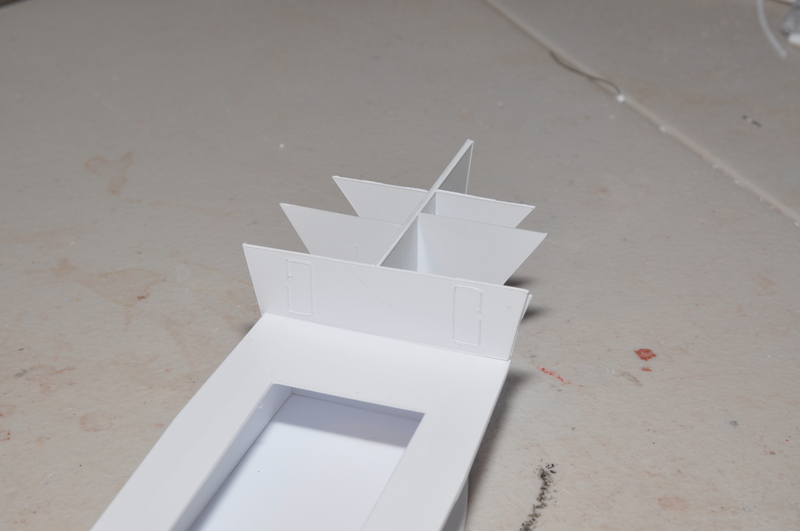 Begin the navigation bridge by cutting and gluing pieces cut from a strip to the bottom. Glue the deck level to the construction. 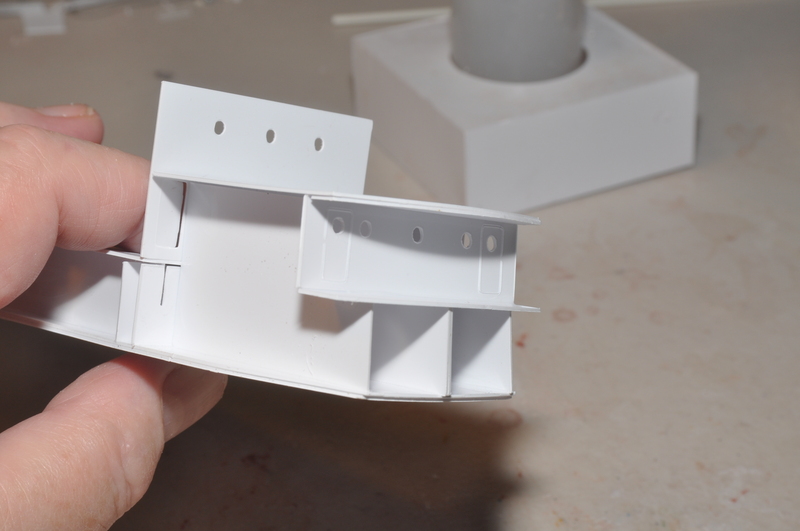 On the inner side of the front, make a score just below the windows and carefully bend the piece. Glue the sides. This is a good time to add acetate for windows, if desired. Glue on the rear roof and the rear windows. 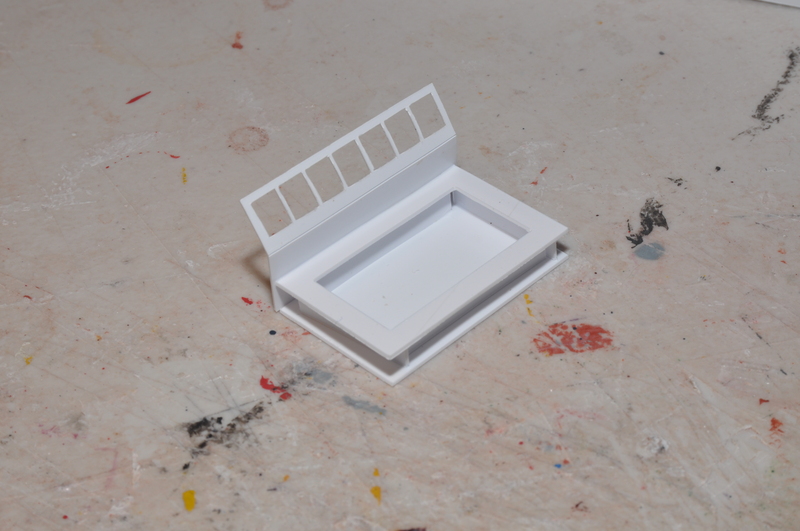 Then glue on the main roof, with the overhang to the front to form a sunshade. The remainder is installing details and assembling minor components such as cranes. Use pictures of the finished ship to determine locations.